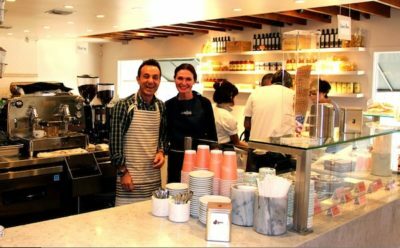 GINO RINDONE and Elizabeth Angelini at Angelini Alimentari Italian cafe. Angelini Alimentari is open 7:30 a.m. to 4:30 p.m. There’s free parking in the back until 11 a.m. and two spaces for pick-up orders all day. True to their name (Alimentari means “grocery” or “foodstuffs,”) they also sell jars of four of the Osteria’s most popular pasta sauces, including limone and amatriciana, for $9.99 each. They are perfecting their daytime menu now, but would like a liquor license and might expand to casual dinners some day. Angelini Alimentari, 7317 Beverly Blvd., 323-297-0070, angelinialimentari.com.